This is what you call determination. Gannett is not going anywhere. 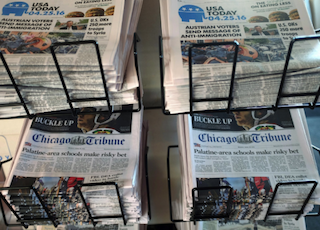 The company said it still wants to buy Tribune Publishing even with Tribune changing its name to Tronc and becoming a spaceship in the future or something like that. “Gannett values the 11 iconic newspapers of Tribune and has determined to keep its offer in place as it evaluates various near-term developments, including the Tribune second quarter 2016 financial results, which are expected in August,” said Gannett, in a statement. Gannett’s last offer—which was rejected by Tronc—was for $864 million. If those second quarter results aren’t good, you can bet Gannett’s next offer will be far less than that.